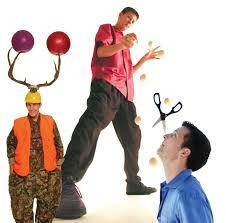 Bryson Lang has entertained thousands with his unique Comedy - Juggling act. A World traveler, Bryson has performed in Iceland, Bosnia, Norway, Japan, Germany, Canada, the U.K., and all across the U.S. Most recently Bryson has been featured in variety revue-shows including a year-long contract in Tahoe, five months in Laughlin, a run in Atlantic City and Beijing and two months at the Shinagawa Prince Hotel in Tokyo, Japan. ”Masters of Illusion" series, his act won first place on the "Extreme Gong Show", and his skills were seen on the series, "Charmed" and the sitcom, "That 70's Show". In Film, Bryson has appeared in, "Austin Powers II" and "Batman and Robin", starred in the independent film, “The Boogeyman’s Birthday”, and has been a featured act at Corporate Events for Disney, Toyota, Marriott, Major League Baseball, and Farmer's Insurance, to name a few. Bryson has been in several Commercials including, "Hollywood Video", and he has delighted audiences aboard Cruise Ships around the world for Royal Caribbean, Holland America and Celebrity Cruise Lines among others. Most recently Bryson has been the MC for a musical USO tribute show called the Swing Dolls that features his act and MC skills in theaters nationwide. The Cure For The Common Show! !